The past seven months have been extremely rough for me and my family; My wife has been ill and I was laid off from my six-figure paying job. Between paying hospital bills, providing for our three children and paying mortgage and bills in the home, I am completely broke. The job search has been extremely difficult, especially since I am playing “mummy and daddy” and also taking care of my ill wife. I have taken out all the money I had in my IRA account. I have gone from living comfortably to having about $100.00 to my name. I have always believed that things will get better. I paid my tithes diligently when I worked and I am still very much committed to the church. My whole family still prays together and we trust the word of the Lord that says in Romans 8:28 “And we know that God causes everything to work together for the good go those who love God and are called according to His purpose for them”. I have not complained about the storms I am going through and I have managed to remain thankful to God for everything. I have been strong for the past seven months, but this morning, when I prayed, I cried. I could not hold back the tears. I cried as I asked God to make a way where there seems to be no way. I reminded Him that I had been faithful and have remained faithful. The doctors were asking for more money, my children were losing weight, I was two months behind on mortgage, I had sold all I had. On my way to the hospital, it was storming heavily and a young man stopped my car. His tire had burst after he drove over a rock in the middle of the road and because of the pouring rain, it was very difficult for him to call a mechanic or fix it himself. He had a lot of things in his car that he didn’t want to leave behind so we put everything in different parts of my car. As we drove, he told me his name, but I was too consumed by my thoughts to remember it. I could tell he was extremely rich because everything he wore looked expensive and while he made phone calls, he gave commands like a CEO. When we got to his destination, a huge office complex that probably had 15 companies within it, he hurriedly gathered his things, thanked me and ran off to avoid the pouring rain. This evening, after I picked my children up from school, my youngest daughter noticed a bag in the back of the car and immediately asked “Daddy…what is this?” I grabbed the bag from her, knowing that it belonged to the man I had picked up, and looked into it. It was money. More money than I had seen at one time. Now…I am sitting in my car, staring at this bag of money that can change my life forever…wondering if this is a BLESSING or a TEST. I can keep the money and believe that God has blessed me through this stranger…or I can go back to the office complex and try to find this young man among thousands of people or even take the money to the police station. Is this a Blessing or a Test? Let us know what you think by commenting below. 1 Peter 1:7 – These trials are only to test your faith, to show that it is strong and pure. It is being tested as fire tests and purifies gold – and your faith is far more precious to God than mere gold. So if your faith remains strong after being tried by fiery trials, it will bring you much praise and glory and honor on the day when Jesus Christ is revealed to the whole world. Also…stay tuned for more thought provoking stories like this on Mondays. This entry was posted on Monday, January 7th, 2013 at 6:44 am	and posted in Thought Provoking. You can follow any responses to this entry through the RSS 2.0 feed. It is a test. He should return the money and perhaps God can even touch the young man to reward him better. How can people live with their conscience if we keep what belongs to others. It is a test.That money is not his money.By returning it to the owner heaven will open for him through that small act of kindness that will change his life for ever,even more than he can imagine. I believe it is test. When we look at it from the point of view that it was a good deed performed that led to the discovery of the bag of money. If it was a blessing it might have come in many different ways that does not need to pull your conscience and leave you debating if it is a blessing. I believe when God blesses he does not leave any room for doubt of where the blessing came from. Secondly I will say it’s better to err on the side of cautiion and try to find the owner of the money and then be told it’s a gift than to assume it is and then run into the trouble of being label a thief. 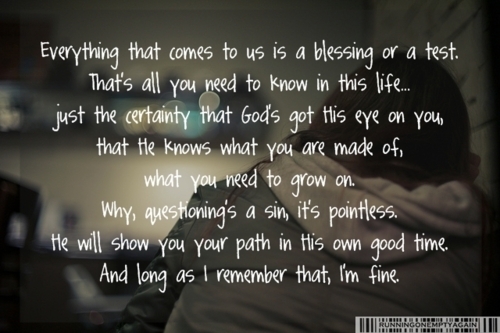 It is a test of faith. In all situation the Bible says we have to be faithful in all situation. He need to go find the man where he dropped him off. God is God all by Himself He will reward his faithfulness .,if he does not return the money that mean he stole the money Ex 20; 15 says You shall not steal . This is a test that may very well be converted to a blessing if he follows the advice above.